Cowabunga dude! 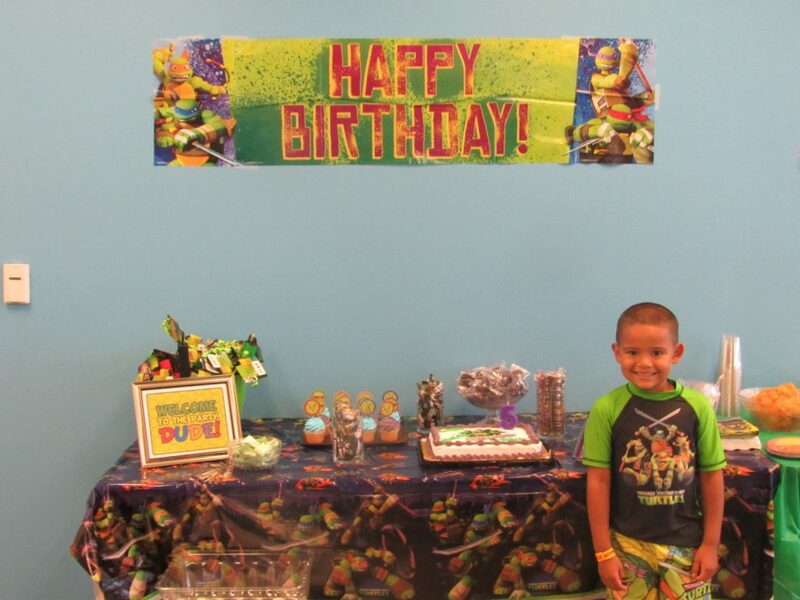 The Teenage Mutant Ninja Turtles are BIG in my house…and TMNT was the chosen theme for my older son who just turned 5! When it came to choosing a venue for the party, I chose the East Oakland Sports Center. They have an amazing indoor aquatic area and a roomy party room just off the pool. 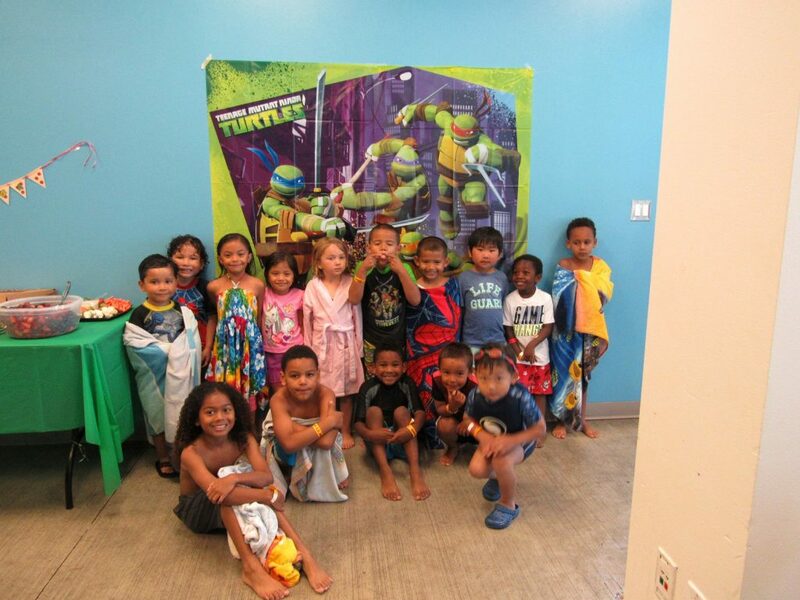 Since his birthday is in the summer, I figured a swim party would be the perfect way to celebrate…and it truly was a big hit! We picked the perfect day to host the party, and while there was a public swim session, it wasn’t too packed and very comfortable for our guests. The pool and swim areas were very same and since the majority of our swimmers being about 5 years old, the depth at their height was perfect. 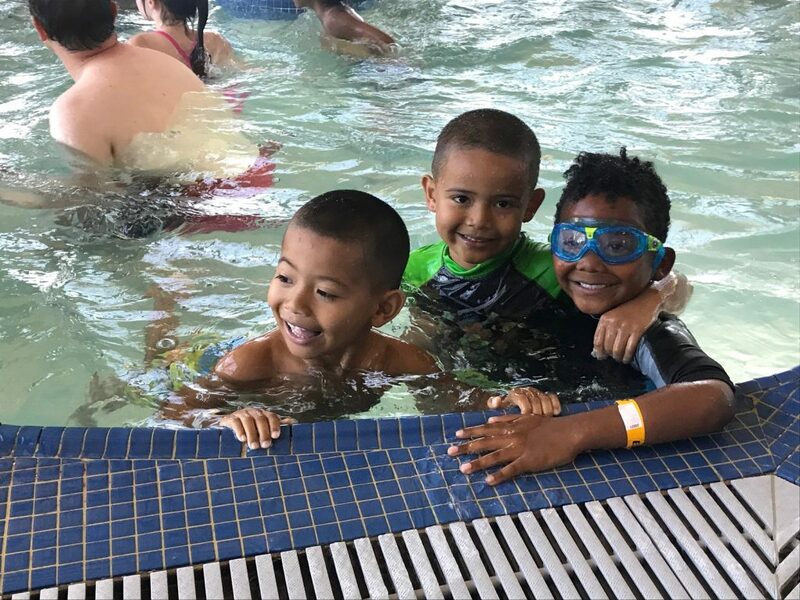 Also, they have a great staff that’s very accommodating and lifeguards who kept a watchful eye on all the kids on the pool deck. 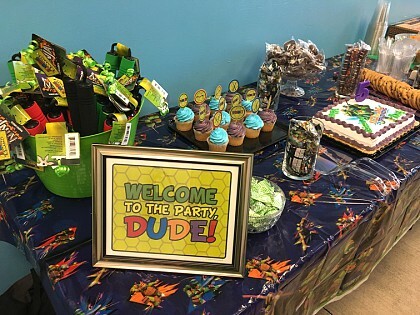 When it came to decor, I used a lot of these well-designed party printables, like the welcome sign, cupcake toppers, favor tags and pizza banner! 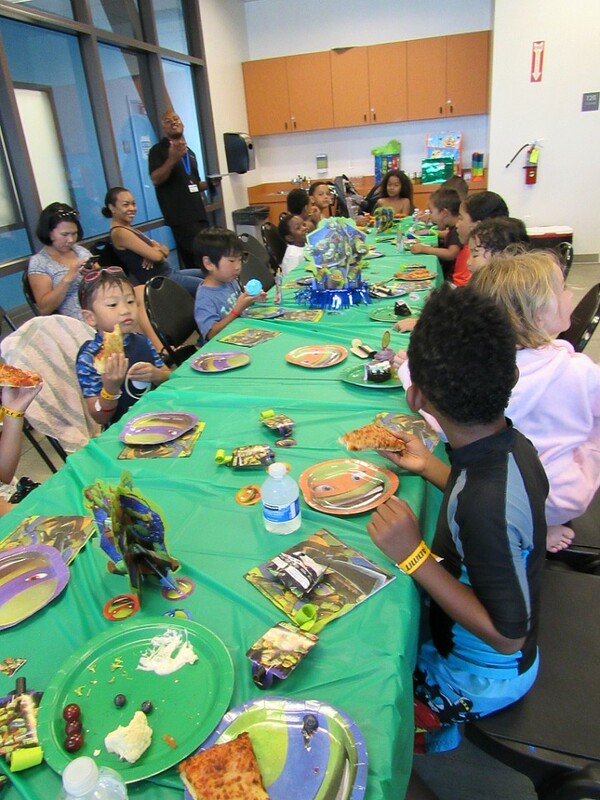 I created a long table for the kids to sit at and covered them with plastic green table cloths and a store bought ninja turtle table decor set, and I used the ninja turtle face plates, party blowouts and coordinating napkins to liven up the decor! 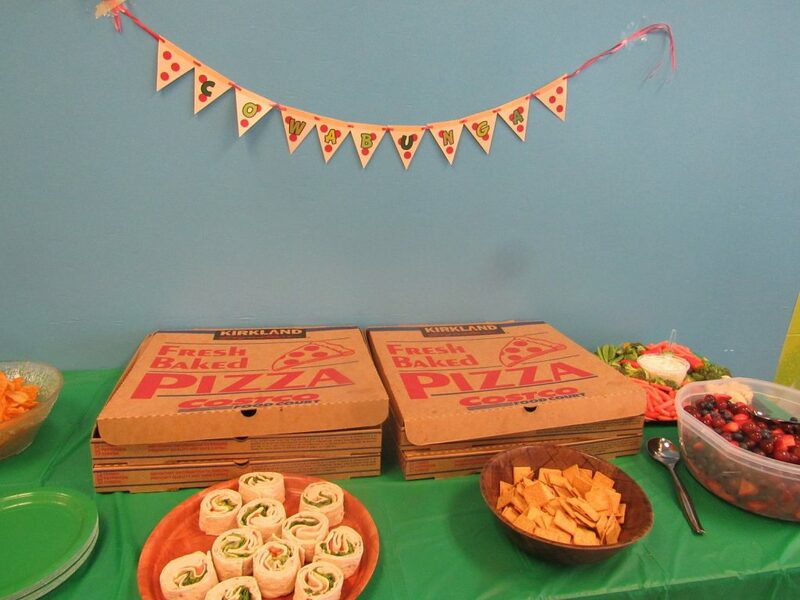 As far as food for the party, I kept it simple with pizza – of course ninja turtles and kids (grownups too), love a cheesy pie. I did an easy fruit salad, veggie platter, chips, crackers and some chicken and swiss cheese rollers to complete the spread. It was just the right amount for that post swim hunger. I also purchased a TMNT themed “scene setter” to serve as a backdrop for photos..kids love the life size characters, and it helps brighten up empty wall space. 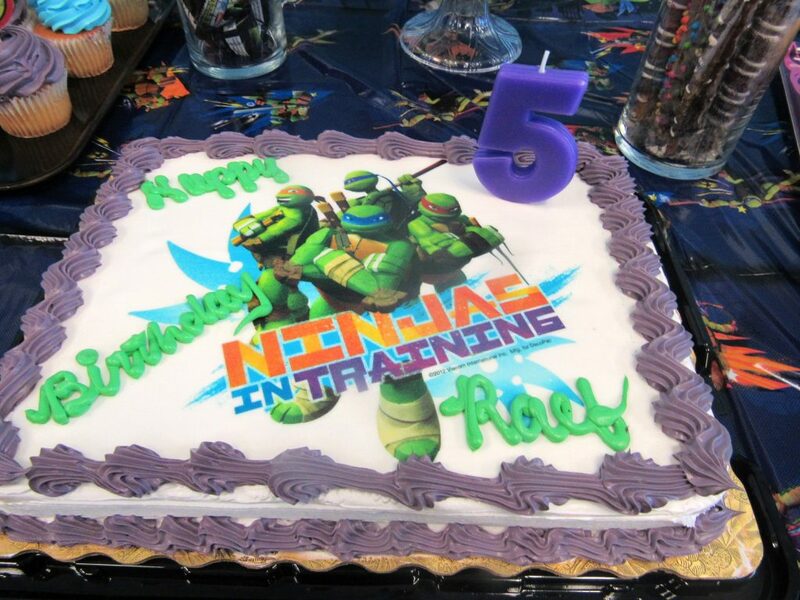 I ordered the cake at Food Maxx, where they printed out an edible ninja turtle print. One of my favorite elements for the party were our favors! 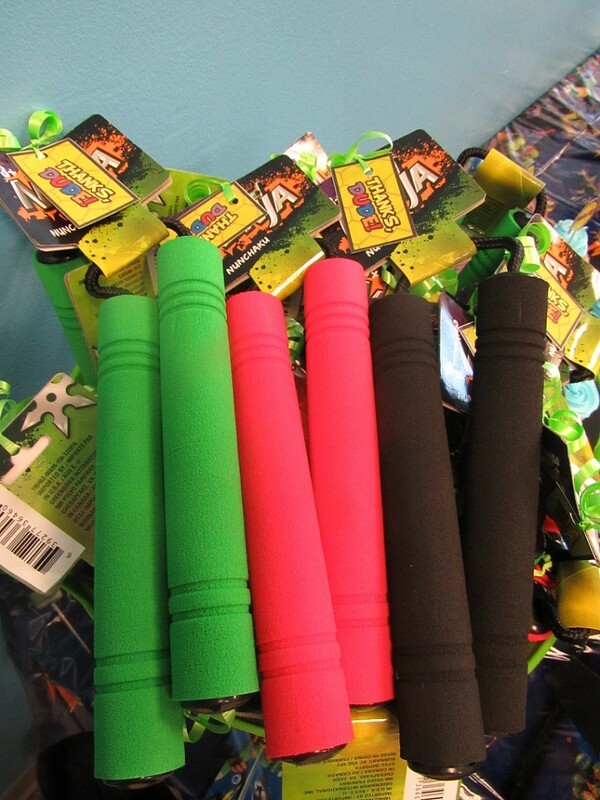 I found these foam “nun chucks” at Dollar Tree, added a thank you label, and it was the perfect compliment to our party theme. 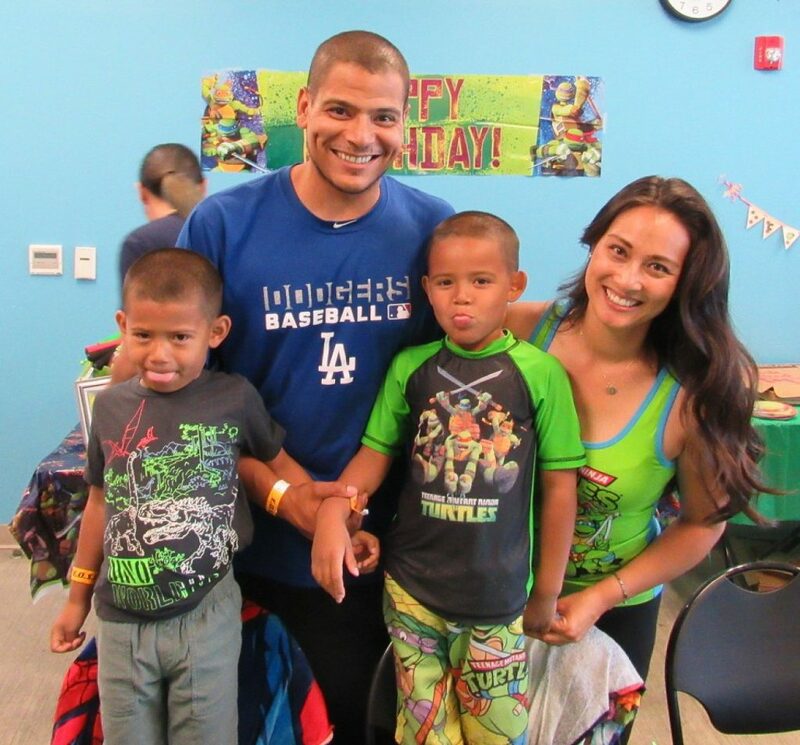 Needless to say, we all had an awesome time… Thanks to all our friends who joined in the fun and celebrated with us!